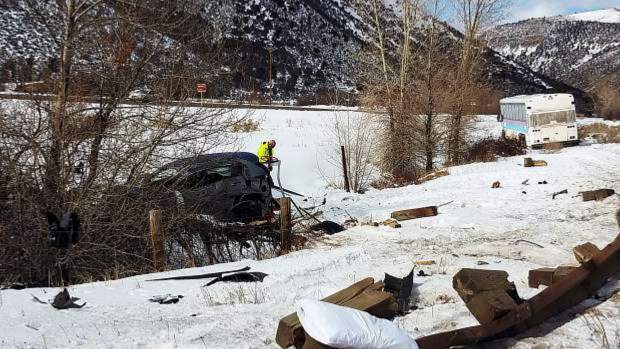 The state transportation department and Pitkin County plan to install more and better signage at a Woody Creek intersection where a fatal crash took place more than two weeks ago, an official said Wednesday. Beyond that, however, major changes to the intersection of Highway 82 and Smith Way are more problematic, said Brian Pettet, Pitkin County’s public works director. Pettet met with members of the Colorado Department of Transportation at the intersection Friday to determine what can be done to improve safety there. The meeting came in the wake of the death of NBA agent Dan Fegan, 56, who attempted to drive across the downvalley Highway 82 lanes in an SUV on Feb. 24 and was struck by a Roaring Fork Transportation Authority bus. Fegan’s 5-year-old son and 29-year-old nanny were injured in the crash. The accident reignited community debate about the dangers of the intersection, which has seen fatal crashes in the past. The intersection averages 2.6 crashes per year, according to CDOT statistics, Pettet said. An email sent Wednesday to a CDOT official requesting statistics for other intersections along Highway 82 for comparison was not returned. The new signage should be installed at or near the intersection within about two weeks, Pettet said. The additions will include a “stop ahead” sign already ordered by the county that will be installed before drivers on Smith Way arrive at the intersection. That sign will cost about $100, he said. CDOT plans to replace a temporary stop sign for drivers who want to cross the downvalley Highway 82 lanes to head upvalley, Pettet said. Department employees also will transfer a “one way” sign now bolted to the second stop sign at the intersection for drivers heading downvalley to the newly installed stop sign for upvalley drivers, Pettet said. Finally, CDOT will add another flashing light to the lower portion of the downvalley stop sign. That sign will then have red flashing lights at high and low points on the stop sign, Pettet said. The department also will repaint the stop line at the intersection this summer. A flashing light will not be added to the stop sign for upvalley drivers because it has been hit before by drivers on Highway 82, which made CDOT leery of adding electrical current to it, he said. The officials also discussed making the intersection a roundabout, adding a traffic signal and forbidding upvalley access at Smith Way in favor of what is known as a “Michigan left turn,” Pettet said. None are ideal, he added. First, the roundabout “doesn’t make sense there” because of traffic flow, Pettet said. Second, evidence shows that adding stoplights to a state highway in areas like Smith Way does not necessarily make them safer, he said. Finally, a Michigan left turn — essentially requiring vehicles to turn right downvalley, then merge left to a median crossing and merge again into the upvalley highway lanes — presents its own set of problems. Those include the expense of constructing such a project, as well as requiring merging drivers to enter the left-hand, fast lane of Highway 82 and possibly deal with other cars in the same lane slowing down to turn left at Smith Way, Pettet said.